SWAT (Special Weapons and Tactics) was a tremendous experience for Captain Peters. “I wish I could have spent five years there,” he says. He enjoyed it so much that he considered passing on an opportunity to become captain. But, the LAPD top brass recognized characteristics and qualities in him that were needed for good leadership. “There is a greater purpose here” he was told. 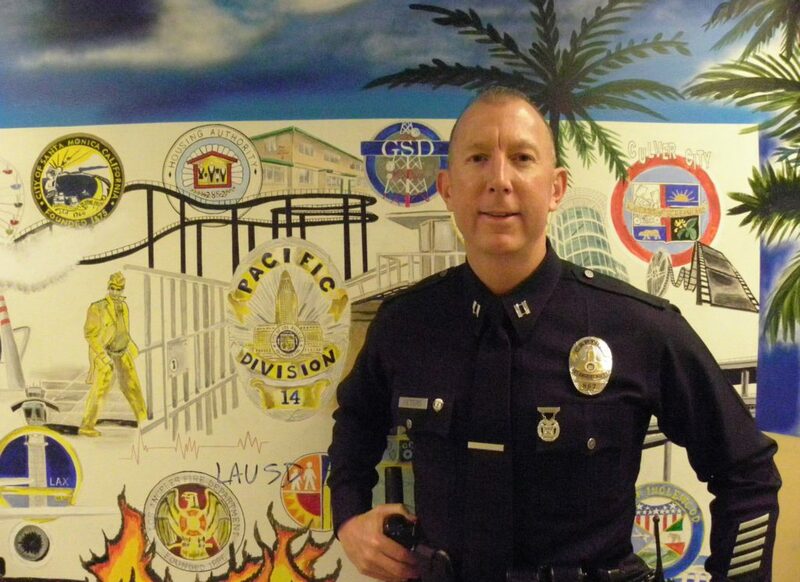 January 2013 begins Captain Peters fourth year at Pacific division. He is quite familiar with the area and has personal ties. He was born in Santa Monica and his wife, Cathy, was born and raised in Westchester. She still has family in the area plus both have friends who live in the community. In order to improve, Captain Peters was fortunate to continue his leadership education through the different phases of his career. The department sent him to the Sherman Block Supervisory Leadership Institute and the Senior Management Institute for Police in Boston where he joined managers from police agencies all over the country. Some of those classes were taught by instructors from the John F. Kennedy School of Government at Harvard University. He also went back to school for a Master’s Degree in Organizational Leadership at Gonzaga University. It’s important for Captain Peters to be the best leader possible for his sworn and civilian personnel. “I want to help them do their job,” he says. “I need to motivate them, inspire them, but also hold them accountable. To do that, you need to communicate clear expectations, model the way in both word and deed and be consistent in your values. You need to connect with your people on a personal level. If you have a position like I have, people aren’t always going to be happy. At the end of the day it’s not always about being liked, but, that they know I care about them as people and you’re hoping that they will respect you.